It’s so easy to make your own mixed media art journals, diaries for self-reflection, notebooks for to-do and grocery lists, planners with calendar pages, notepads for phone messages, custom sketchbooks with sheets of watercolor and drawing paper, books with envelopes as the pages…the possibilities are endless and the more you make the more ideas you’ll have! Best of all, the shape, size, and thickness are entirely up to you. And they’re inexpensive, too. I love to make simple books to give as gifts and I use a lot of them around the house, especially in the studio. I keep them in the car and in my purse. The more, the merrier. This project couldn’t be easier. It’s about decorating front and back covers and adding the inside pages. Done! I leave high-end bookbinding to others. The easiest way to make simple journals and note pads is to start with standard size papers, index cards, or envelopes. That way there are no pages to cut – just the two covers. There are many simple-to-use and affordable punching and binding systems for this kind of book – disks, wires, coils, rings. 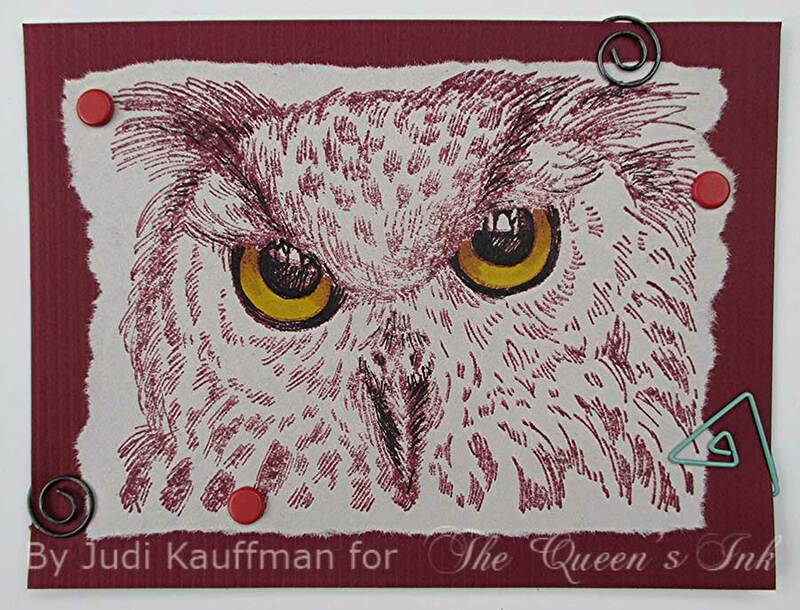 You'll find the Cinch from We R Memory Keepers at The Queen’s Ink! 1. Randomly paint heavyweight paper with paints in shades of gold, rust, teal, and metallic gold. Use long strokes; allow colors to overlap. Let paper dry. Hand- or die-cut a bunch of simple almond-shaped leaves. 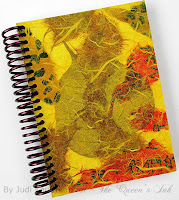 Design Detour - The size and number of leaves you’ll need depends on the size of the journal you’re making. If you draw a lot of branches or are using small leaves you’ll need more than six. 2. 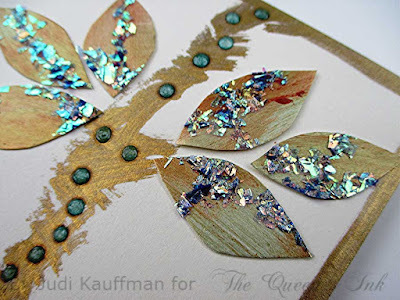 Add sparkle to the leaves with chunky glitter, randomly applied over wet glue. 3. Cut pieces of mat board for the front and back covers. 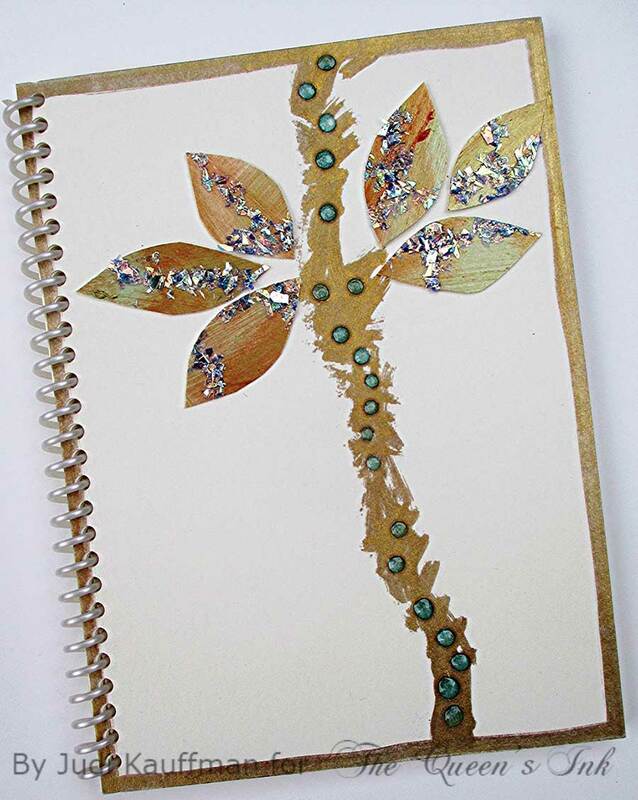 (Shown: Light ivory) Edge both cover pieces with a gold metallic paint pen. 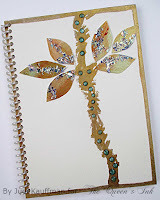 Use the same paint pen to draw a vertical branch on the front cover. Glue the leaves in place, clustered in trios as shown or as you prefer. (Tip: Plan and practice the branch on a piece of copier paper before working on the mat board if you’re not confident about working directly on the cover. Draw a very light pencil guideline if needed – the gold paint is opaque and will cover your guideline. 4. Arrange the inside pages. (See ‘Design Detour’ right above the supply list.) 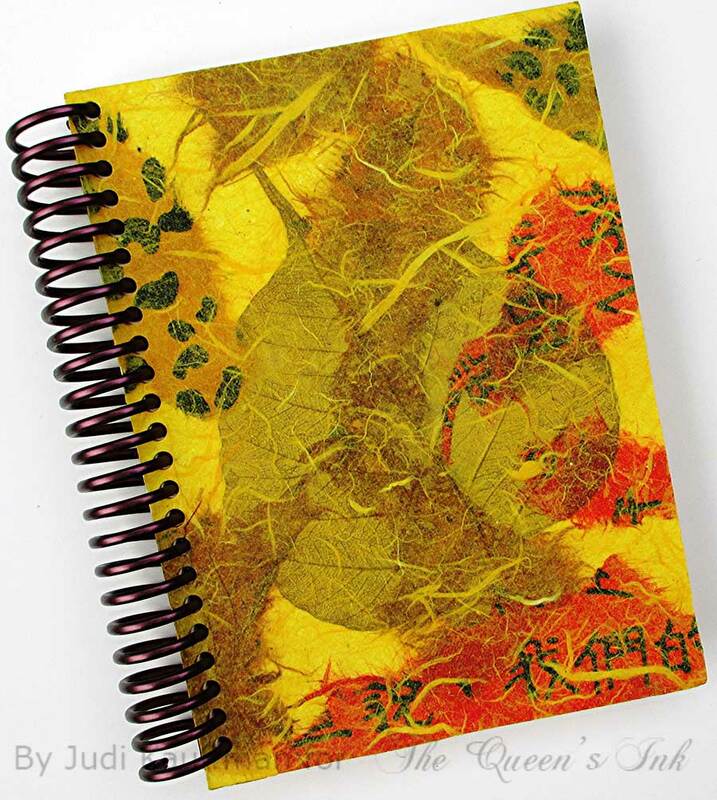 Following the punching/binding system manufacturer’s instructions, bind the journal. Design Detour – Pages can be all the same size or you can vary them. You can include tabbed pages, contrasting color pages, a few envelopes, or whatever you want! 1. Cut pieces of mat board for the front and back covers. Design Detour – This journal has standard 4” x 6” index cards and coordinating tabbed dividers for pages; covers measure four and three-eighths by six so the tabs aren’t visible when the book is closed. 2. Create a torn paper collage for the front cover that includes at least one large skeletonized leaf. Add a final layer of lightweight mulberry paper to unify the colors in the collage and protect the leaf. 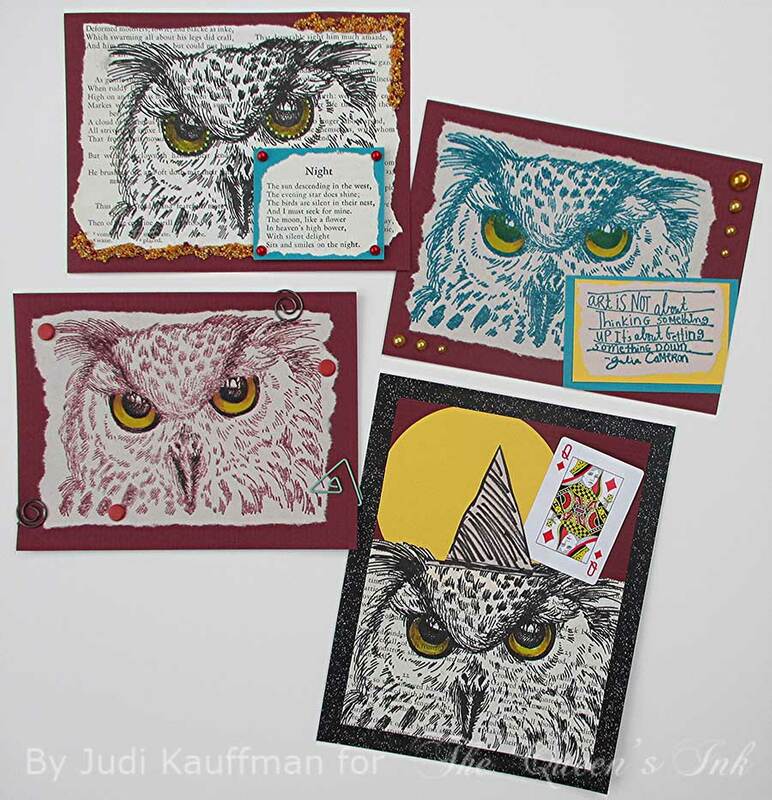 I used USArtQuest Perfect Paper Adhesive - Matte (PPA) to adhere and seal all layers. Option: Create a second collage for the back cover. Design Detour – To echo one of the colors in the collage, line the covers with solid color paper or paint in a matching hue. I chose bright red! 3. Arrange the inside pages. Following the punching/binding system manufacturer’s instructions, bind the journal. If you’re using only one kind of paper for the pages there’s no need to ‘arrange’ them, but if you’re alternating plain and tabbed pages or different colors, or lined and unlined, then you need to put them in whatever order makes sense to you! For example: Smaller pages first or all envelopes at the front of the book, or alternating lined and unlined pages, etc. Here’s my story and I’m sticking to it: Easy isn’t cheating! The four cards I designed for this post are super simple. They are flat, meant to be displayed on a small easel. If you prefer, use a folded card base. 1. Stamp the owl onto pages from a damaged book or onto newsprint using black, cordovan or teal ink. 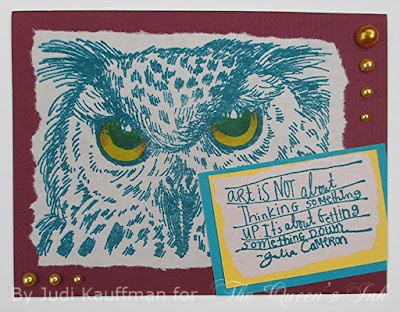 Tip: If possible, choose text that goes with the stamp and position the stamped image so that you have controlled the copy that remains visible above the owl’s head as shown in the photo below. 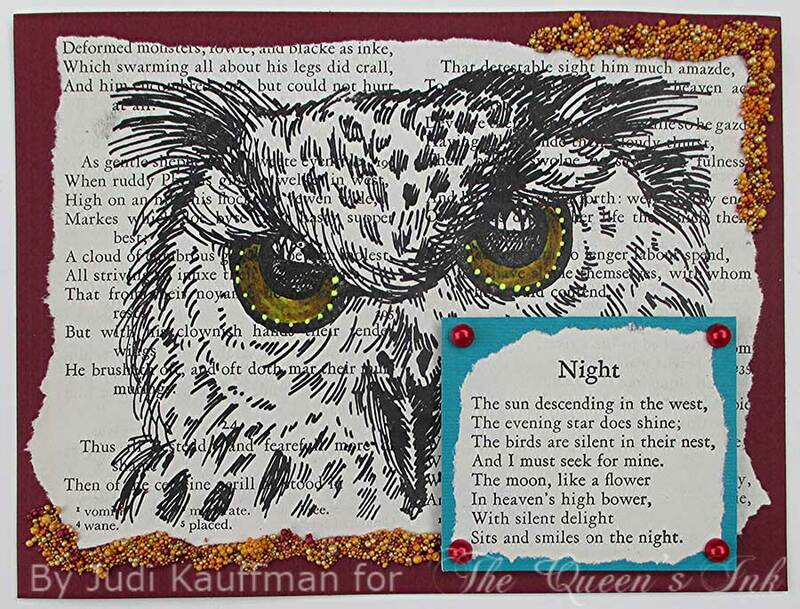 Find and tear out a quote or poem that relates to the theme, too. 2. 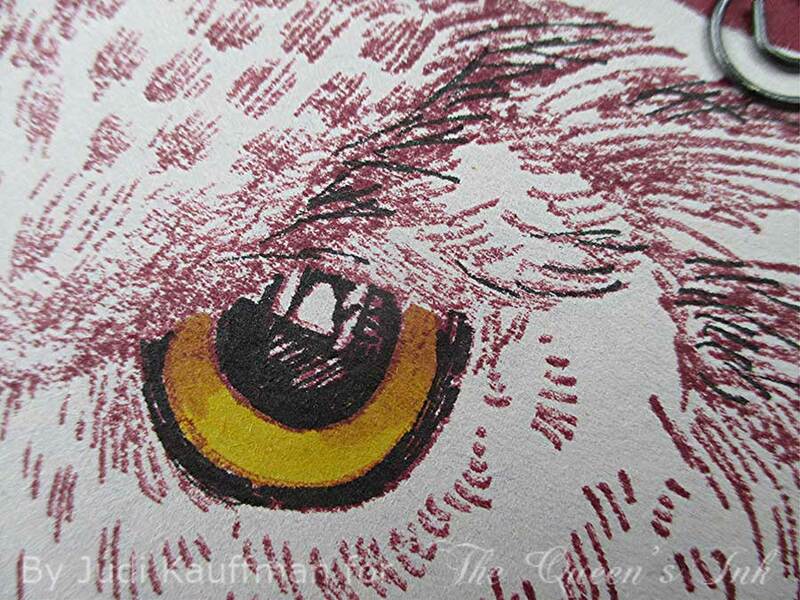 Color the owl’s eyes with yellow and orange markers. Option: Use an opaque yellow pen to add bright yellow dots around the eyes as shown in the photo below. 3. For a Halloween card, hand-draw and cut out a 2.5” tall witch’s hat. On a 4.75” x 6.25” vertical cranberry cardstock rectangle glue down a yellow moon at the upper left (yellow cardstock circle) and trim as shown. 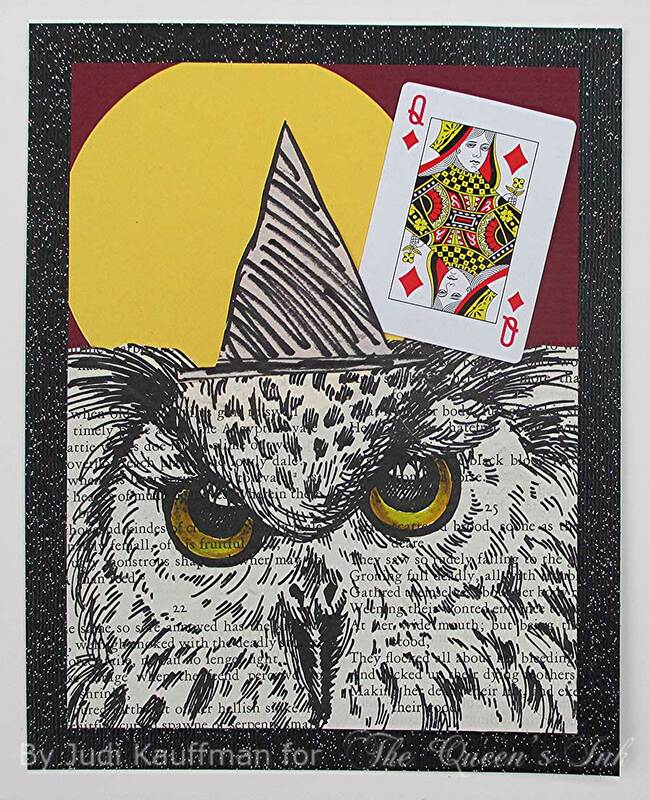 Then glue down the owl (fussy cut along the top edge), the hat, and a mini playing card – THE QUEEN, of course! 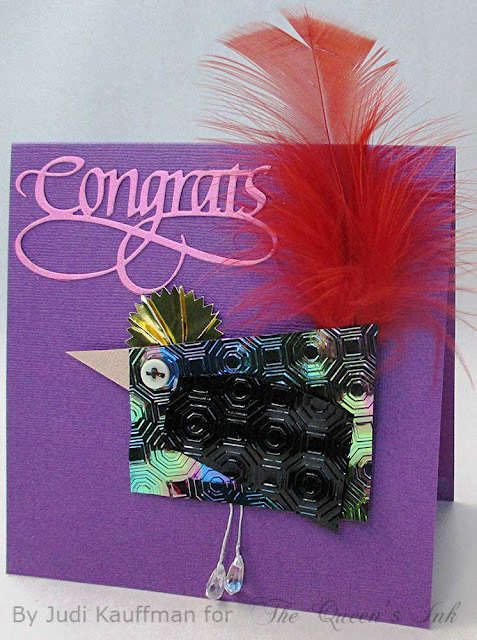 Border with black glittered cardstock. 4. For all other cards, tear around the stamped image and use a glue stick to adhere to a contrasting horizontal rectangle (shown: Cranberry cardstock 4.75” x 6.25”). 5. Option: For owls stamped in colors other than black use a black fine nib marker to reinforce the pupils and border around the eyes, as well as to accent the beak and feathers as shown below. 6. 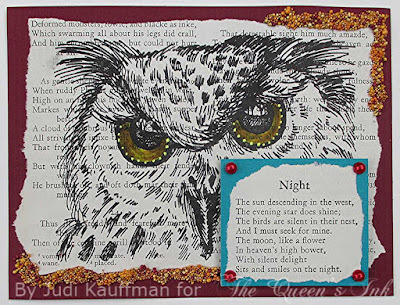 Add a single or double border to a stamped quote or the poem torn from the damaged book and position it toward the bottom right. Option: Use foam squares beneath the rectangle for added dimension. 7. Use we glue to add Gourd-Jus Prills around some of the torn edges for extra texture and color as shown below (and in the photos before and after step 2). 8. Embellish with half-pearls or with brads and spiral- or triangle-shaped paperclips. A lot of mixed media artists add fibers and stitching to their projects. Have you tried it yet? 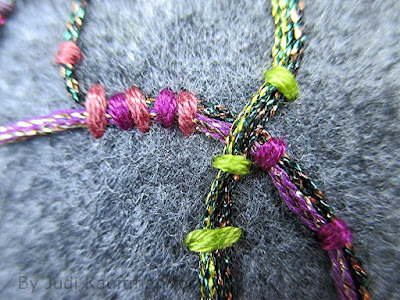 I thought it would be fun to include some stitches here on the blog now and then. I decided to do something a little different from what you might usually see: Instead of using a piece of canvas I chose soft, recycled felt. 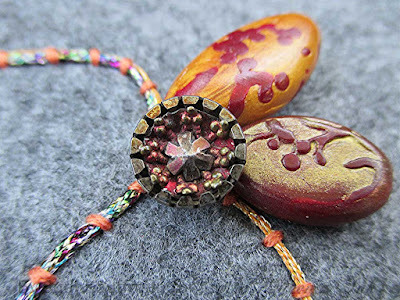 And instead of layering on paints, collage and stenciling, I used only a single stitch – couching – and two little clusters of embellishments – polymer beads and vintage buttons, ensuring that the embroidery takes center stage. My goal was to keep it SUPER easy for beginners. 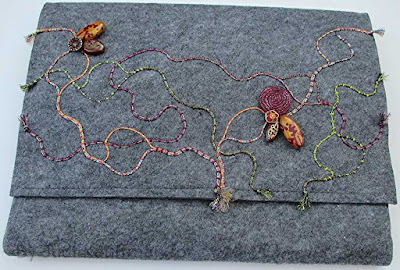 I picked a felt envelope, a clutch-style bag with a snap closure that would be simple to sew and is available as a readymade product. I’m going to use it as a cover for my tablet device, but it could be a purse for a minimalist (someone who doesn’t carry everything but the kitchen sink, the way I do). Couching is an incredibly versatile stitch. It’s one of my favorite ways to DRAW with fibers. 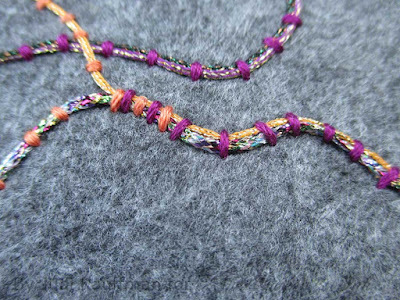 A long thread that remains on the surface is held in place by short stitches that cross it, one at a time. 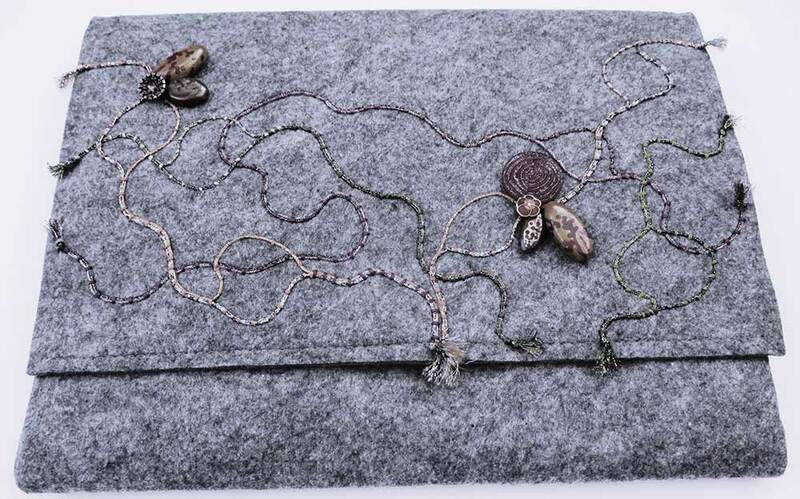 The short stitches go up and down through the fabric layer (in this case the flap of the felt envelope) at intervals. 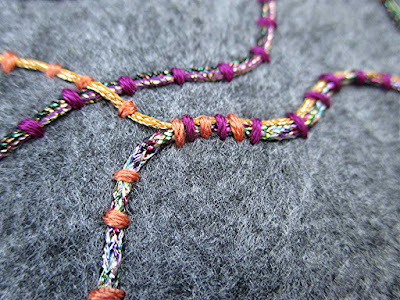 These couching stitches can be perpendicular, or at an angle, evenly-spaced or randomly-spaced. 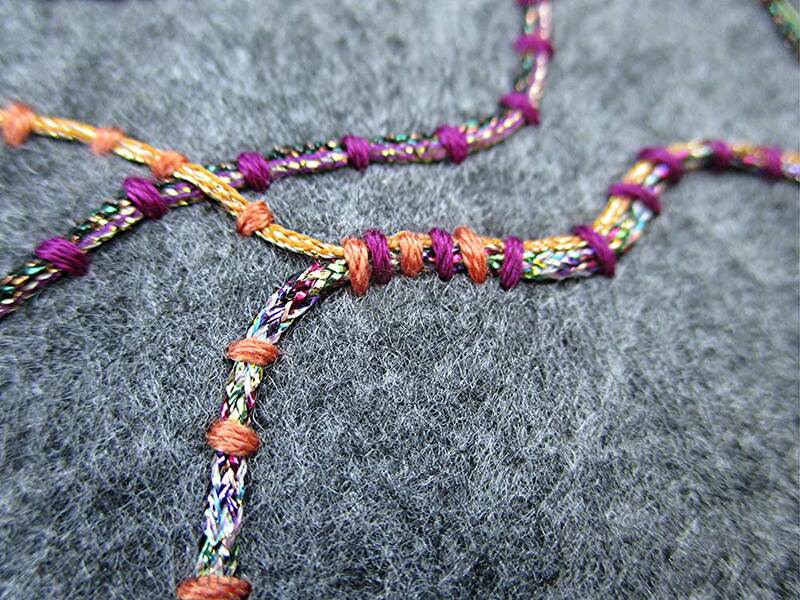 It can get quite elaborate – each stitch can be studded with a bead or a more decorative stitch (not just a plain one), but that’s for down the road at some point. 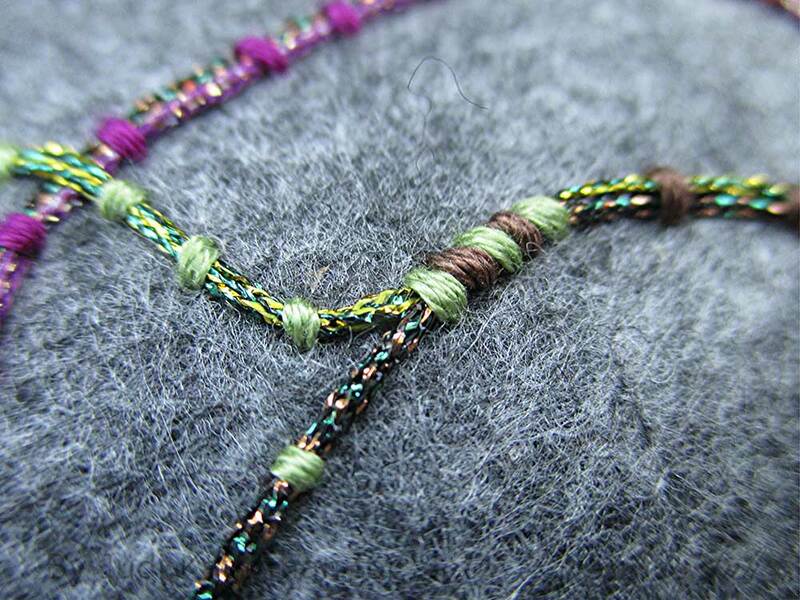 I chose metallic braids for the surface threads and 6-strand cotton embroidery floss for the short stitches, using all 6 strands. 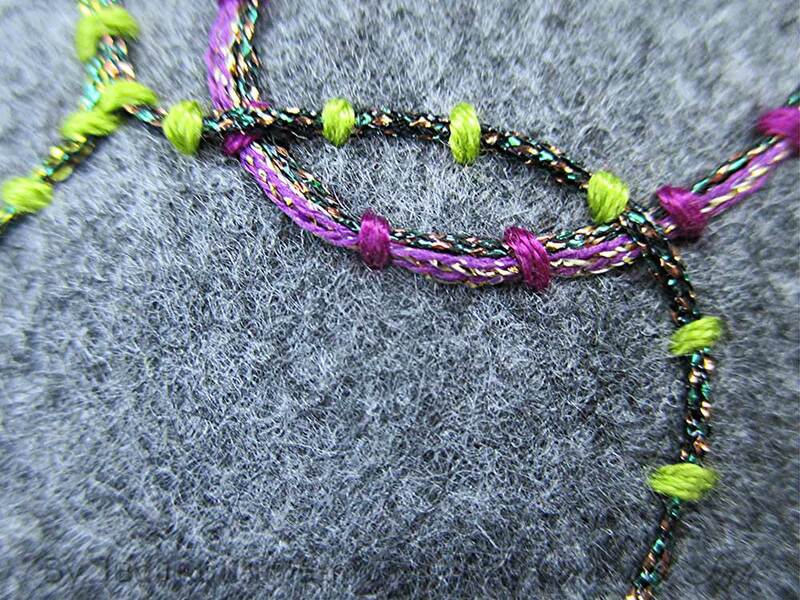 You can use much heavier fibers or much finer ones, depending on the line weight and the look you want to achieve. 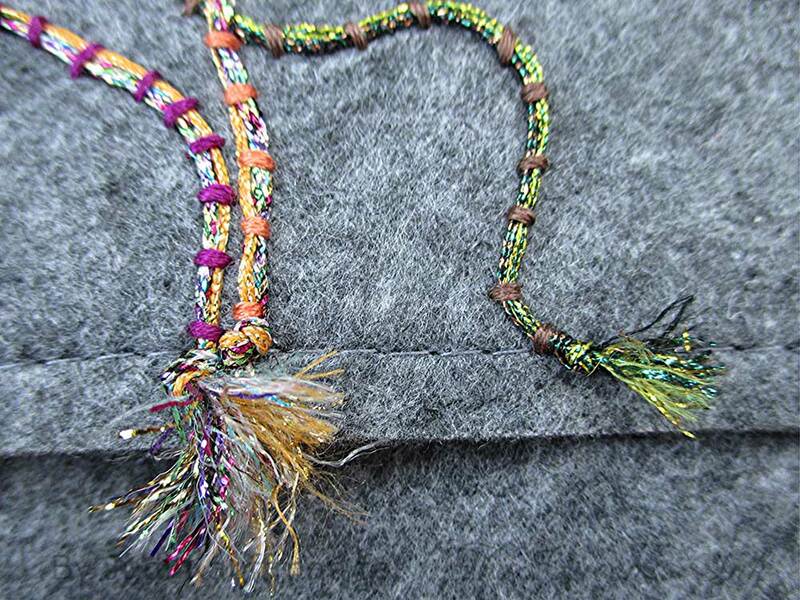 For example, I could have used clothesline instead of metallic braid, and held it in place with sewing thread – very heavy lines with almost invisible couching stitches to hold them in place. 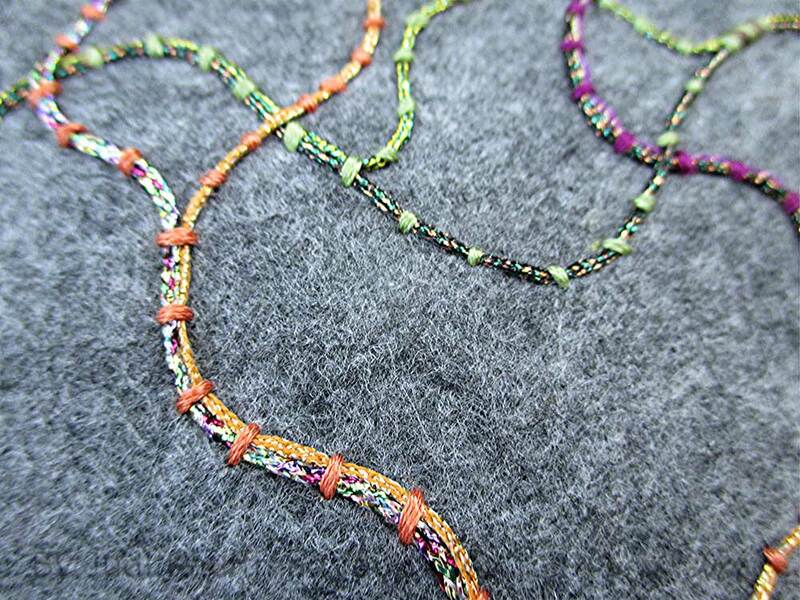 Or I could have held hand spun wool (knitting) yarn in place with metallic braid. 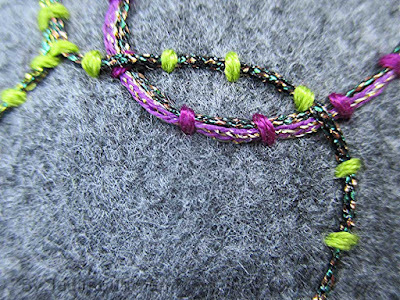 The short stitches can be prominent or subtle. It’s endless! 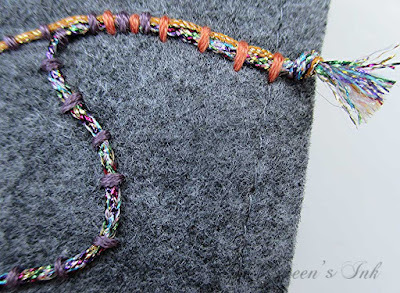 As you will see from the close-up photos, my long (surface) threads are either single or double, sometimes the two held together for a thicker line weight and other times separated so they are thinner. 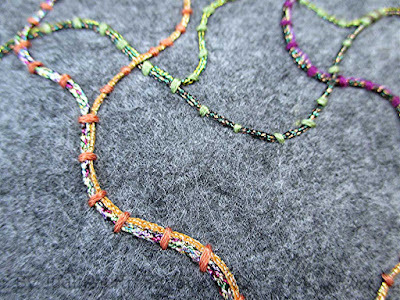 Wherever they converge after forming an open shape I changed the color of the embroidery floss and put several stitches close together so that the color change resembles ‘wrapped’ threads. When you scroll down to the final photo right before the supply list, you’ll see an unsaturated image, showing the project in black and white. 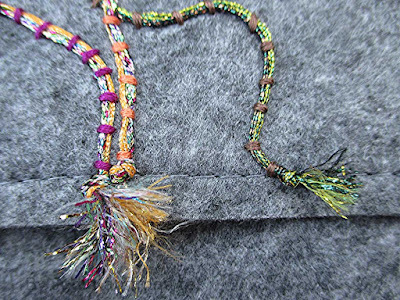 It shows how the lines meander and overlap and how the main elements within the design (the LIGHTEST lines that are accented with beads and buttons) move from left to right, all the way across the flap. The little tassels? Glad you asked! 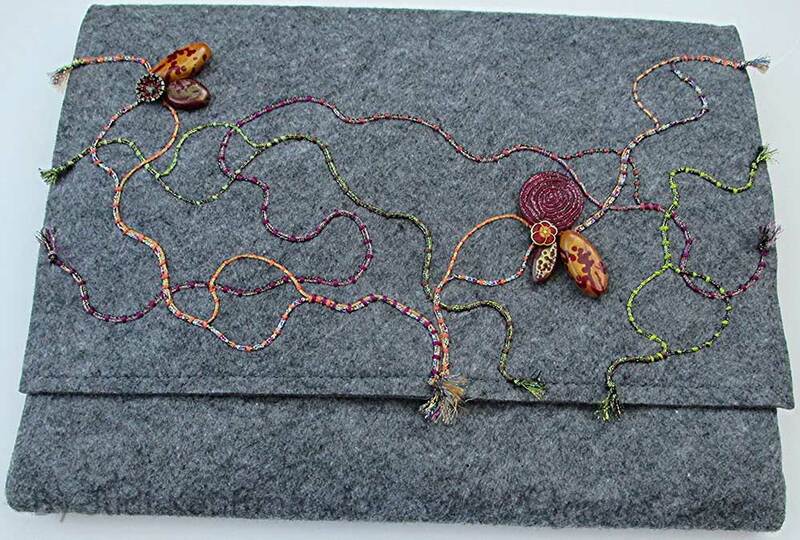 Those are knots, strategically placed at the edges of the flap to draw the eye and add a visual treat. 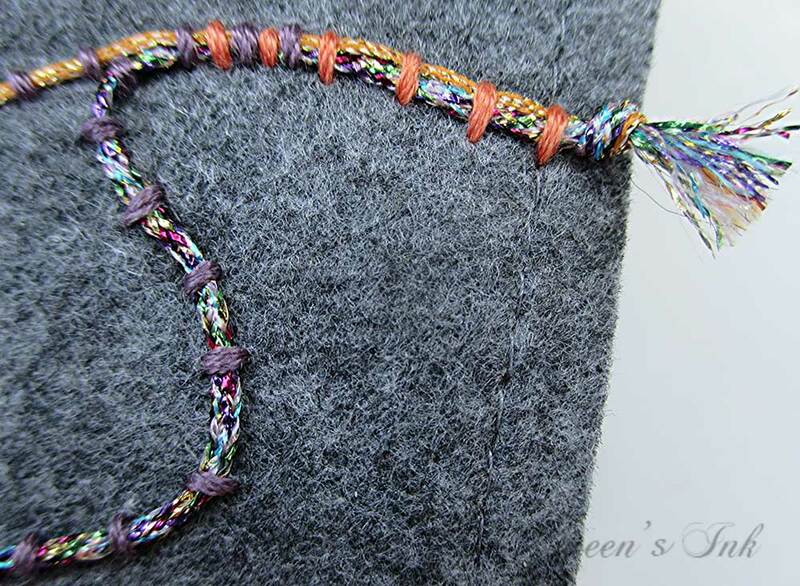 Each piece of metallic braid is cut to about 5/8” beyond the knot and unraveled with a corsage pin! (It’s fun and fast, not at all tedious…) Metallic braid is a true ‘braid’ made with many strands. If you’re using embroidery floss, you’ll automatically have lots of strands beyond the knots. Feel free to print out and trace the lines if you want to use my design as a pattern. Don’t want to stitch on felt? No problem. A piece of heavy muslin is a good fabric on which to practice and you could die it, paint it, stencil it, or spray it with inks if you want a colorful base layer instead of a plain neutral. Just be sure that you allow the fabric to remain relatively soft. It can be challenging (sometimes impossible...) to hand stitch through fabric that has been made stiff with layers of paint. 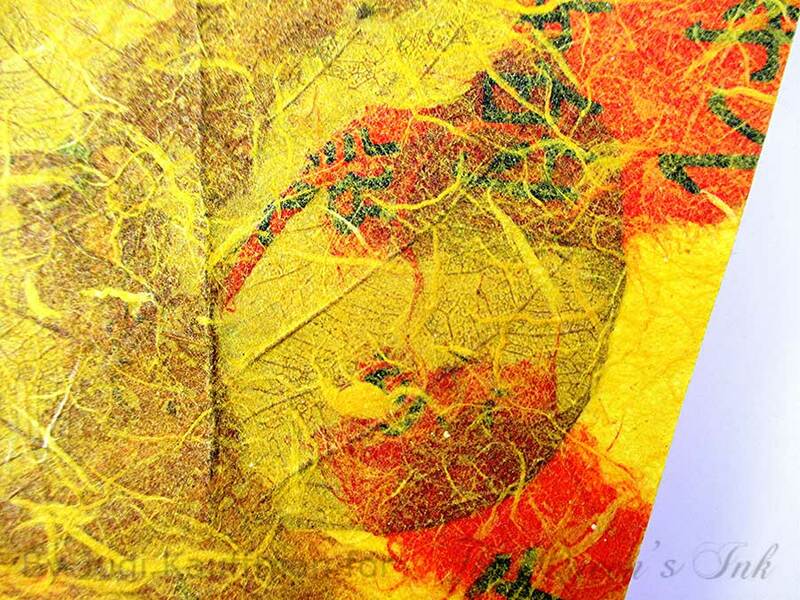 If there is enough interest, I’d love to teach a 'Stitchery for Mixed Media Artists' class at The Queen’s Ink! Please leave a comment here on the blog, send an email or call the store if this is something you’d like us to schedule. ManneqArt Masquerade... Get Your Tickets Now! ManneqART is an international arts and education non-profit that inspires creativity, teaches problem solving skills, and rewards excellence in Sculpture on the Human Form. 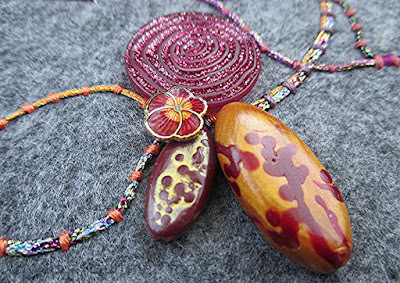 The organization is focused on bringing Wearable Art to the attention of the American public, through a variety of events during the year. The focal point of our season is a Public Display of exceptional designs culminating in a Gala Event where finalists present their work and receive awards. This year's Gala is sure to be full of spectacular art candy, so order your tickets now. The Queen (a.k.a. Patti) has an entry in this year's exhibit, as well as Royal Customers Ann Hoover, Sherry Kirn, and Sharon Garry. Many of the 2016 entries are now on public display, and will be on display at the Masquerade, where award winners will be honored. Costa Rica provides the ultimate blend of tranquility and excitement and the perfect setting for inspiration. We are returning to this enchanted Paradise and hope you will decide to join us for 7 nights and 6 days as we create art, explore, and re-energize in this tropical haven far away from the stress and demands of daily life. Patti Euler, Kristen Powers, and Terry Quinn will be your hosts again this year and they have planned a week full of unique mixed media workshops designed specifically for this venue, all of them included in your package. We are extremely excited to announce that we have a special guest artist joining us this year. One of Costa Rica’s premier artists, Jacques Quillery has agreed to help us refine our painting techniques and teach a one day acrylic painting class. Jacques will be sharing his approach to painting Costa Rica flora and landscapes and his use of bold tropical colors. This is an amazing opportunity, and we feel a major highlight of our retreat. You can check out some of Jacques’ work at www.costaricangallery.com. 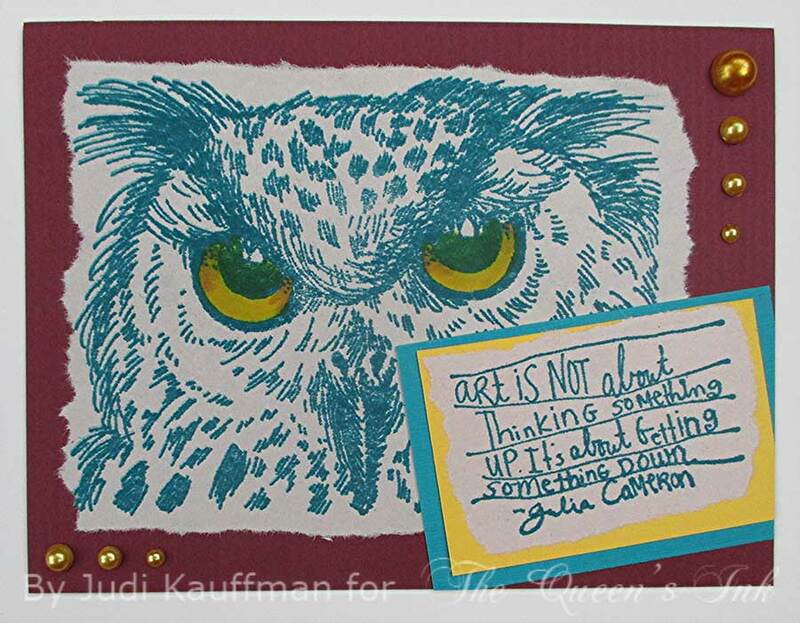 All of our mixed media art projects have been designed so that you will complete them before you leave. 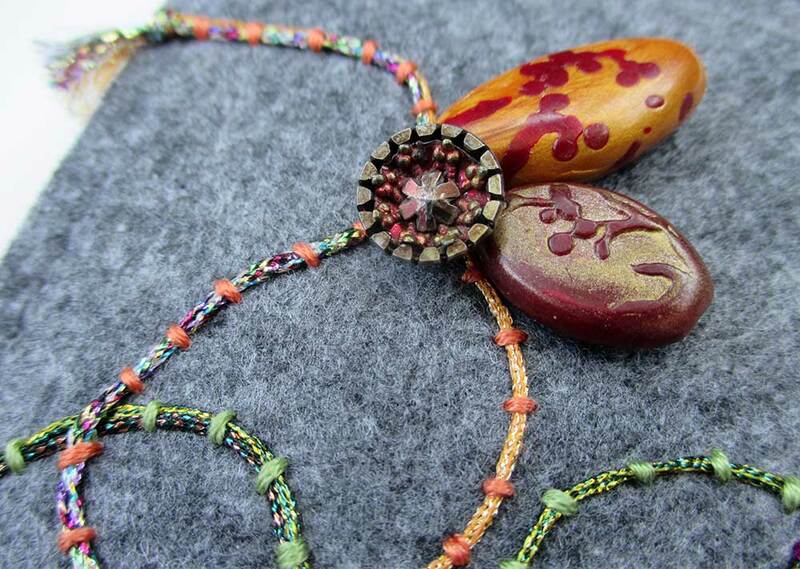 Throughout the week there will be plenty of open studio time allowing you to continue creating, and we promise there will be plenty of time to schedule excursions, go shopping, or explore the outdoors and nature at its finest. Zip lining not your thing? Relax on the beach, take a dip in the pool, or indulge in a massage or facial at the OnZen Spa. There’s plenty to see and do in Costa Rica. Pura Vida! For complete package information including rates and other important details, and registration, please read the Retreat Flyer. 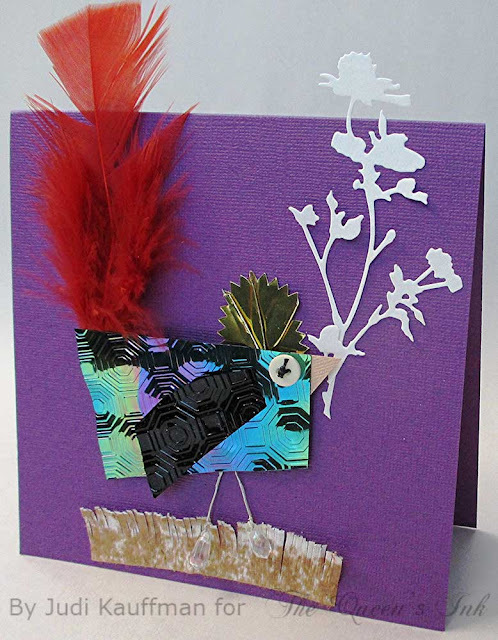 This time I’ve used 4” blunt-cut feathers for the tails on a pair of whimsical sparkly birds. 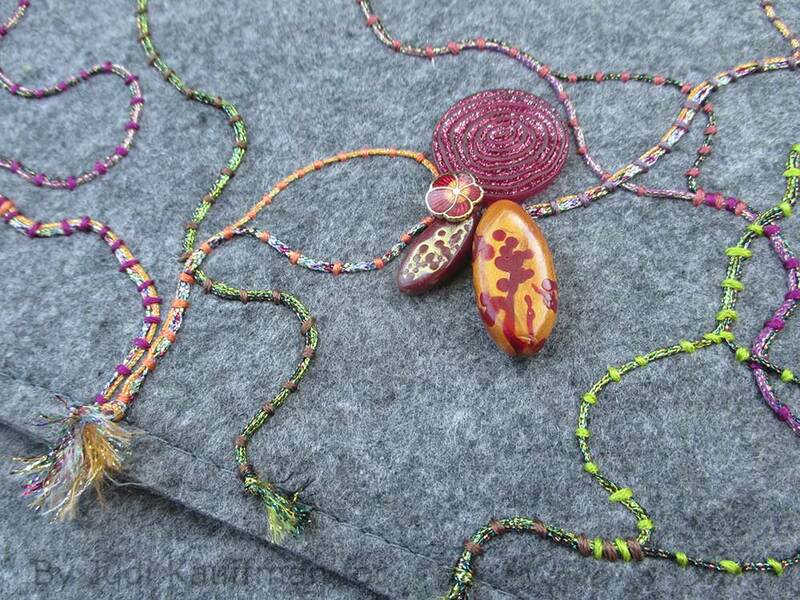 The birds began, as projects often do, when I looked down at some scraps sitting on my work table and saw something other than random scraps. In this case it was embossed Black Iridescent and Basic Black Shimmer Sheetz pieces, leftovers from a mosaic I’d made. 1. Cut a randomly-shaped wonky 4-sided shape for each bird’s body and a 4-sided wing piece with one of the long sides curved instead of straight. The curved side is the top of the wing. 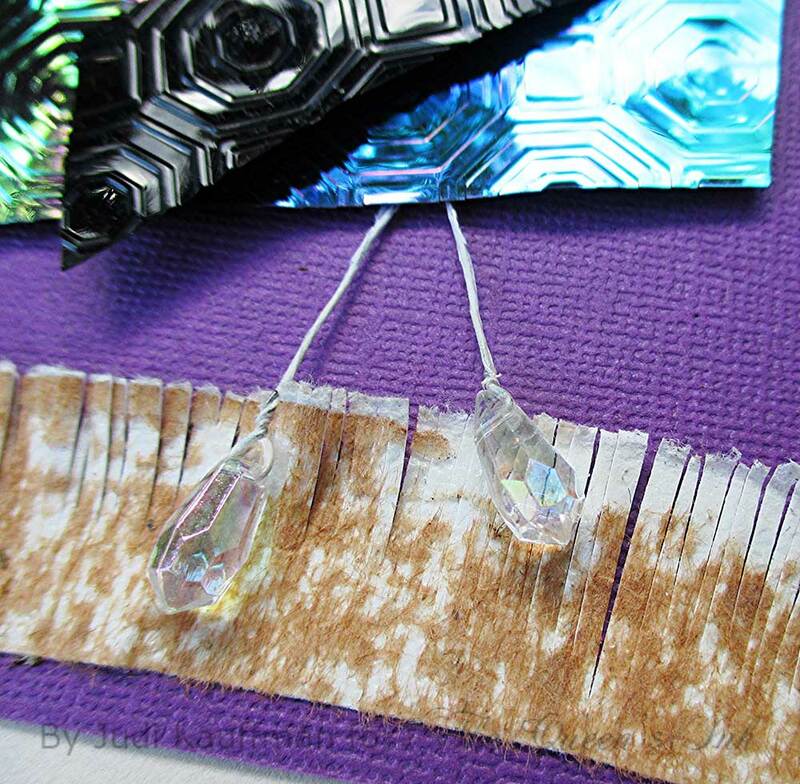 Adhere these layers onto the card front, adding dimension with small pieces cut from Power Tabs. Design Detour: I cut each Tab into four strips. A little goes a long way. 2. Add a glittered cardstock triangle for the beak and a button for the eye. Use a button with two holes and tie the black cord so the knot is visible on the front (top side) of the button. The cord is purely decorative. Use a snippet of a Power Tab to secure the button. 4. Add the tail feather using another snippet of a Power Tab to secure it behind the bird’s body. 5. 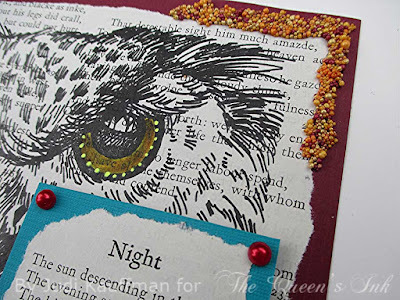 To finish the card fronts, create a ground line or simply add a sentiment toward the top (or both!). I cut a leftover strip from the top of a newsprint pad for the ‘grass’ below one of the birds and put die cut wildflowers into its beak. (Both the wildflowers and the newsprint pad strip have appeared in previous projects – more leftovers put to use!) I added a glittered cardstock die cut sentiment to the other card. 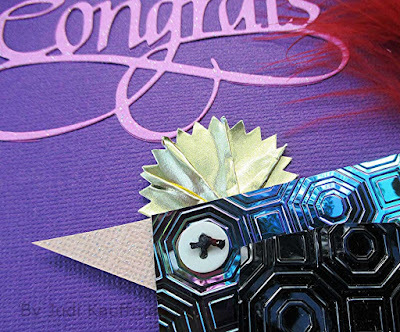 Design Detour: Back the cardstock with double-sided adhesive before cutting the sentiment – no wet glue needed with that method. The cards are 6” square with a top fold. 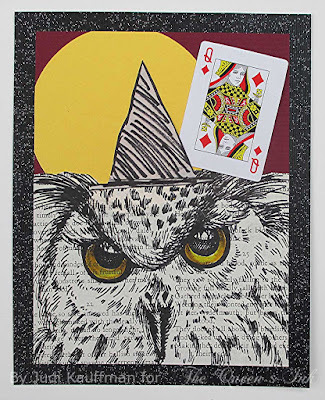 The size of your bird/feather combo will determine the dimensions of your card. Vary as you choose! Tiny birds would be great on gift tags or Artist Trading Cards. Design Detour: For these, you’ll need a larger envelope for mailing because the tails and wildflowers extend past the top edge. 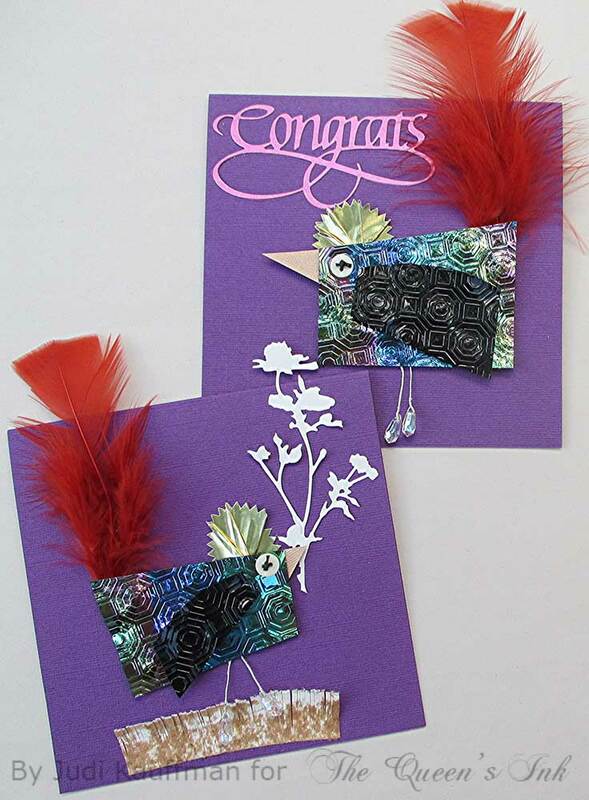 Protect the card with a sheet of paper so the feather and die cut pieces won’t get bent in transit. My color choices for the birds were accidental, but it was a happy accident. Black Iridescent Shimmer Sheetz reflects various other colors including yellow, blue, pink, and purple (kind of like the feathers on a crow), while Basic Black is shiny black like patent leather. Change to any two colors you want, or make the body and wing out of the same one! Design Detour: If you want to slightly tone down the shine of the Shimmer Sheetz, lightly sand the surface. The ‘core’ color will be revealed when sanded. Play with embossing folders. I stuck with an allover pattern because I was using scraps, but you could go for wavy lines or any other design that looks ‘birdlike’ to your eye. Instead of a button for the eye, switch to a die cut circle with a gem in the middle, a round sticker, a rusty washer, or something else. If you don’t have gold notary seals to cut in half and pleat for the crests, die cut a small zig-zag edge or scalloped edge circle out of lightweight gold paper, cut it in half and pleat one half for each crest. If you don’t have the wildflower dies, use actual pressed flowers from a nature walk! 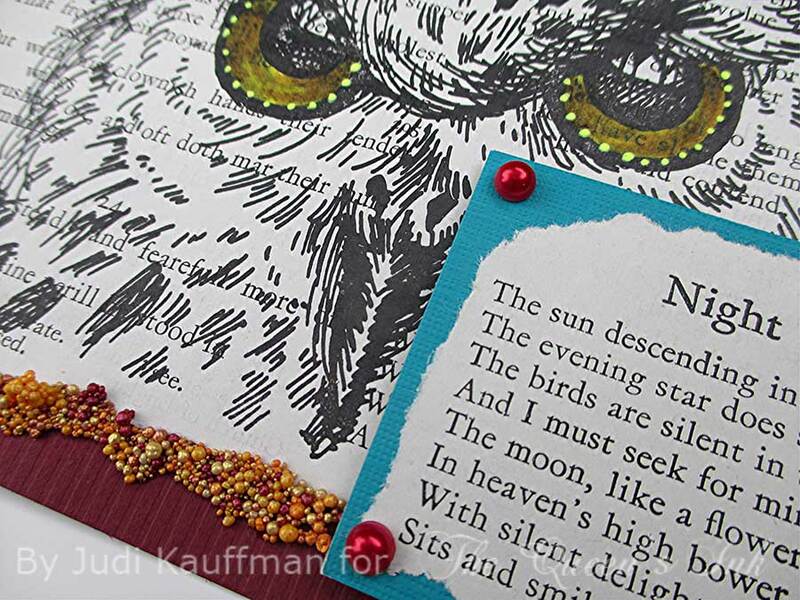 If you prefer not to use real feathers, hand- or die-cut your own or stamp some.